Staff on duty: 24 hours / 7 days a week. Miami Executive Airport (TMB) is one of the busiest general aviation airports in Florida, serving corporate, recreational, flight training, and governmental agency activities. 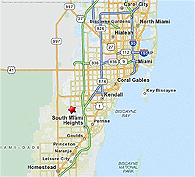 Miami Executive is just 15 minutes from the business centers of South Miami-Dade County. As a reliever to Miami International Airport, its location also provides fast and easy access to the Florida Turnpike, Ocean Reef, the Florida Keys as well as the recreational and business activities in Miami and Miami Beach. The airport provides modern, efficient and professionally staffed FBO facilities serving the expanding corporate and business interests of South Florida. The airport is home to a number of full-service FBO’s, FAA 141 flight schools, FAA 145 (and JAA) Maintenance Repair Stations, Law Enforcement and Medical aviation units, an award-winning FAA-staffed control tower, Miami Automated International Flight Service Station, U.S. Customs and Immigration private aircraft clearance facility, and National Instrument Landing System Test Facility. TMB also participated in the NASA/SATS program. Since 1995, approximately $16 million has been spent on airport improvements including high-mast safety-and-security lighting, repaving and grooving of all runways and taxiways, new airfield signage, widened run-up areas, and a new Customs Private aircraft clearance facility. The Airport is one of five that are owned by Miami-Dade County and managed by the Miami-Dade Aviation Department. Funded safety and security upgrades will control airside access to all FBO gates with restricted vehicle access and combination locks on pedestrian entries. Private development and upgrading of existing facilities have provided more than 160 T-hangar bays and numerous modern corporate and common storage facilities. Additional private development projects are currently under construction and an estimated 500,000 SF of aviation facilities are available. The airport is well-equipped to meet a diverse mix of general aviation needs, including corporate and business-use traffic, fixed-wing and helicopter flight training, governmental support and recreational/sport aviation. Airport-dedicated NAVAIDS provide IFR capability and excellent pilot training opportunities with full ILS and RNAV/GPS approaches. The airport is also home to the Wings over Miami Aviation Museum, their flying events, the annual Sunrise Community Balloon Race and the Miami-Dade College Aviation Program. A large number of professional, service-oriented professionals and experienced companies are eager for the opportunity to meet your full range of aviation needs. U.S. Customs (Landing Rights Airport): 10-6 local winter, 11-7 local summer. One-hour advance notification required, through ATC available ADCUS. Miami Executive Airport is the home for the MIA AIFSS, an air traffic service facility which provides en-route communications; VFR search and rescue; lost aircraft orientation; emergency assistance; ATC clearance relay; origination of Notices to Airmen; processing of IFR and VFR flight plans; monitoring of navigation aids and pilot weather briefings. The Miami AIFSS flight plan area, in South Florida, generates more air traffic flight planning activity than any other FSS facility in the United States. Complete aircraft servicing is available 24 hours a day with prior arrangement. Major maintenance for fixed wing aircraft and helicopters is available at numerous FAA approved repair stations and at other service locations. Self-serve Avgas is available 24 hrs. a day. This is a good neighbor airport and all operations must reflect consideration for adjacent residential communities. Aircraft operators of turbine and large aircraft are requested to use NBAA recommended Noise Abatement Profiles. Training activities should be conducted to avoid making abrupt power changes directly over residential areas. Flight training activities are limited to aircraft weighing less than 40,000 lbs. For further information call 305-869-1700 or e-mail us.